Your voyage of a lifetime awaits. Immerse yourself in the highlights of the Northern Territory & Western Australia as you relax and unwind on this cruise & rail journey. Indulge in the all-inclusive service aboard The Ghan. Tick Broome off your bucket list as part of your Sea Princess cruise. Experience an immersive overnight stay in Margaret River. 24 hour Hop on-Hop off Darwin City Explorer pass. 2 day Kakadu & East Alligator River tour. 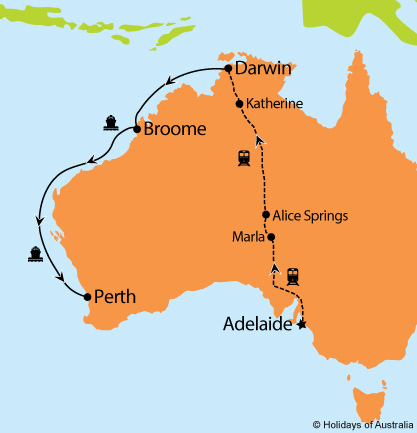 7 nights aboard Sea Princess from Darwin to Perth with scenic cruising along the Kimberley Coast and a port call in Broome. Your cruise includes on board meals and entertainment. Images courtesy of Great Southern Rail, Princess Cruises, Shaana McNaught, Peter Eve & Tourism NT.